Built on 3.5 acres of Prestwood Lake shoreline donated to the City of Hartsville by J.J. Lawton of the Carolina Fiber Company, Lawton Park has many offerings including tennis courts, a boardwalk and pier, two picnic shelters, playgrounds and restrooms. The historic Pavilion at Lawton Park is frequently rented for meetings, weddings, and other events. 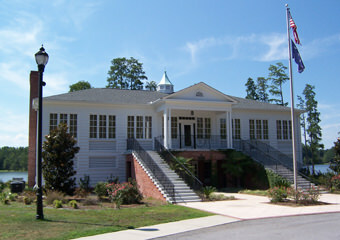 Built in 1938 by the City of Hartsville with funding from the Works Progress Administration, the Colonial Revival structure is an excellent example of a New Deal-era public recreation facility, and is listed on the National Register of Historic Places. The City undertook a major renovation of the facility in 2007-08. The facility features a caterer’s kitchen, an elevator, restrooms and a balcony overlooking Prestwood Lake. The tennis courts are lit. For questions about renting the Pavilion, contact us at specialevents@hartsvillesc.gov or 843.917.0583. View the park’s rental availability calendar here. For rentals, contact 843.917.0583 or email specialevents@hartsvillesc.gov. Interested in booking Lawton Park for your next event? Click here to see the park calendar for available dates and contact 843.917.0583 or email specialevents@hartsvillesc.gov for further information. The Pavilion at Lawton Park was built in 1938 by the City of Hartsville using funds from the Works Progress Administration (WPA), a United States government agency established by President Franklin Roosevelt and the New Deal. The land was donated by J.J. Lawton. In 2008 Hartsville hosted a grand reopening to celebrate the completion of a $500,000 project to renovate the Pavilion and improve the park grounds. The Pavilion is completely updated with central heating and air, a caterer’s kitchen, elevator, restrooms and the addition of an upstairs patio balcony, overlooking the lake. The Southern-style of the Pavilion give a charm to the building not easily duplicated. Lawton Park on beautiful Prestwood Lake in Hartsville has free tennis courts that are open to the public. Ample parking is located next to the courts. Lawton Park has a lovely covered picnic table area, a playground with swings for the little ones, and a boardwalk for birdwatching or fishing. The lovely Pavilion may be rented for meetings, seminars, conferences, and weddings.